This week, I did a bunch of self testing, reworked a few cards and made some more drastic rule changes. It again followed the rule from last week about restrictions making it easier to understand and flow better. This time it was about being to play a card anytime during your turn but you were only allowed to play 1 card of that type per turn. This led to times during testing where I forgot whether I played it or not. It also gave people who were winning a bigger advantage and that’s something I’d to try to has as little as possible. Again, testing is required. Finally, got back to a little bit of coding. 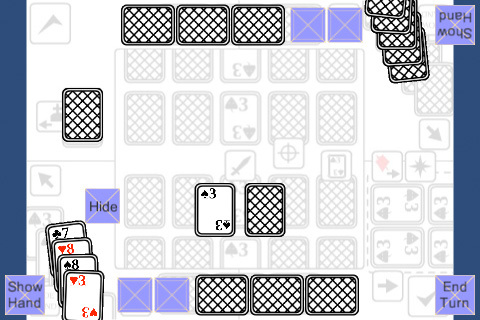 In the above screenshot, the ‘play a card face down’ button is working, though there’s still some work to be done there. What’s next: There’s still some other cards I want to rework but haven’t thought of a good solution yet. Then more self testing and coding wise: would be good to fix those issues with the ‘play a card’ button.